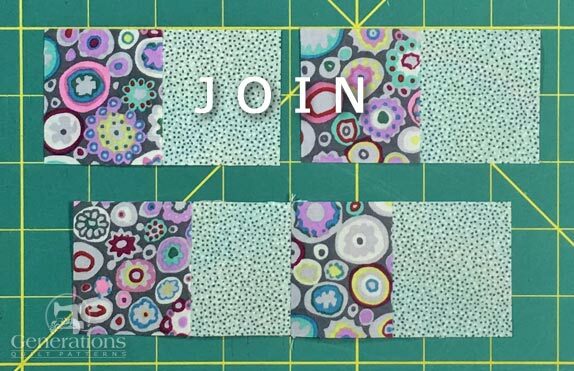 Looks can be deceiving—and the Medieval Walls quilt block certainly proves it! At first glance, it seems like a whole lotta complicated. In reality, there are just three simple sub-units joined together and then separated with sashing. And finally. Not quite sure what you'd do with this block? Check out 10 different quilt designs using Medieval Walls blocks to get your creative juices flowing. Without further ado, it's time to cut up and sew! Please read the instructions all the way through before beginning. 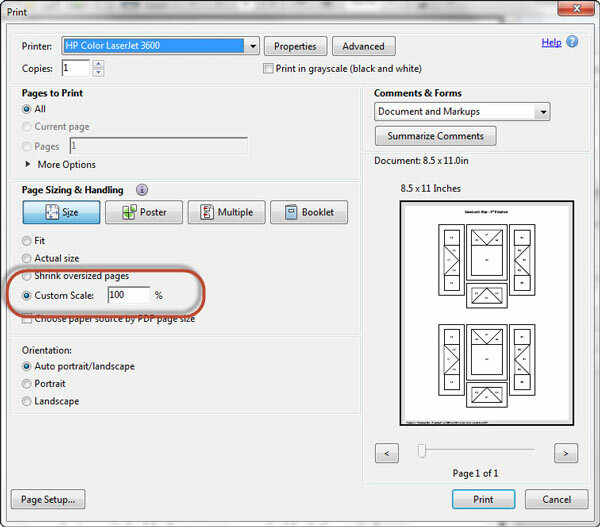 There are two different piecing/cutting options to choose from for one of the units. Pressing instructions are always highlighted in yellow to make them easy to find. 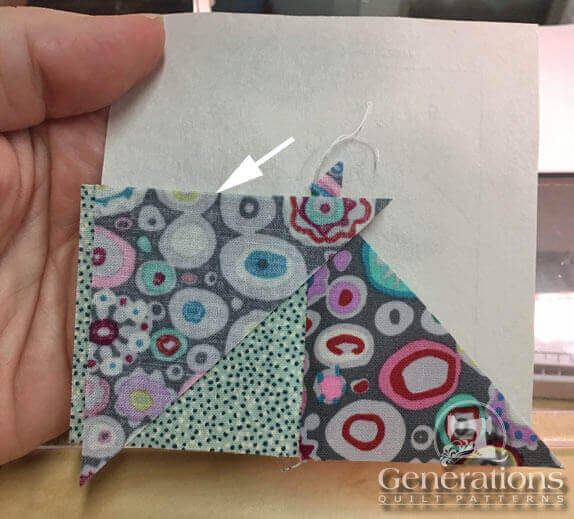 For truly flat patchwork, try this wickedly-simple pressing technique. No special tools required! To construct our Medieval Walls block, we'll paperpiece a unit that we've made before called 'Brave World' with a slight variation. 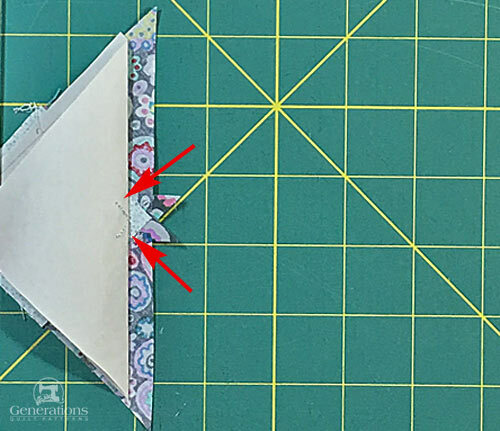 NOTE: If you wish to use traditional piecing methods and skip the paperpiecing, click here to go straight to cutting. You need the most current version of Adobe installed on your computer to download the pattern. Choose your finished block size from the chart below and print the corresponding number of copies for a total of 8 units. 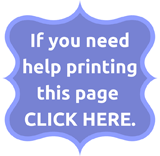 After printing, use the 1" square graphic on the printed page(s) to check that the patterns are printed at the correct size. The important thing to remember when choosing the two fabrics for your Medieval Walls is contrast. 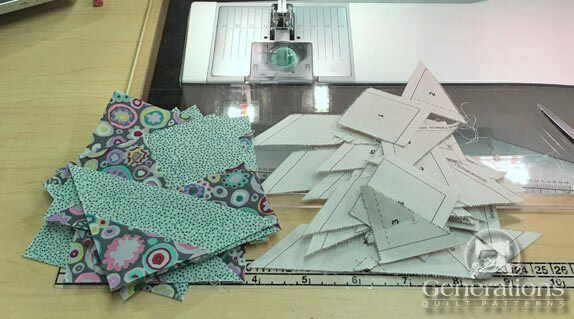 Although the piecing is simple—and all the seams nest if you follow the pressing instructions—there's still a bunch of it. So that your efforts don't go to waste, you want patches with enough contrast to show off all your work. Right? 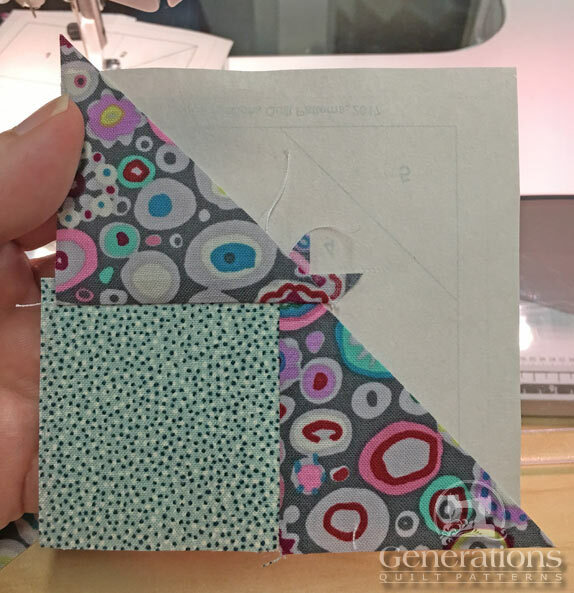 The fabrics in the sample block that follows—while pretty together—are cutting it pretty close as far as contrast is concerned. I like the second version (the red and pale green one at the top of this page) much better. As always, label your patches; the numbers are used for identification throughout the tutorial. If you'd like, click here to download and print the cutting charts and Medieval walls block design to use at your cutting table. Choose your preferred method of piecing and the corresponding cutting chart below. 2, 3, 5	 Dark	 12	 2⅜"	x	2⅜"	 2⅞"	x	2⅞"	 3⅜"	x	3⅜"
4	 Light	 4	 3⅜"	x	3⅜"	 4⅜"	x	4⅜"	 5⅜"	x	5⅜"
2, 3	 Dark	 8	 1⅞"	x	1⅞"	 2⅜"	x	2⅜"	 2⅞"	x	2⅞"
4	 Light	 4	 2⅞"	x	2⅞"	 3⅞"	x	3⅞"	 4⅞"	x	4⅞"
For this tutorial, this unit is paperpieced. However, if you cut from the green 'Traditional Only' chart, click here to skip to those instructions. Otherwise, continue on here. 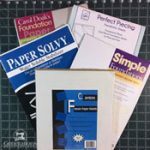 Cut out 8 units from the pages you printed—leaving a rough 1/8" of past the outside light line around each block. There's no points for neatness. These get trimmed in the last step. 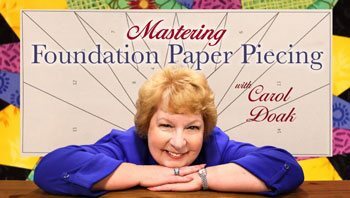 Click here for information on this EXCELLENT CLASS by Carol Doak, paper piecer extraordinaire! On to our Brave World units. 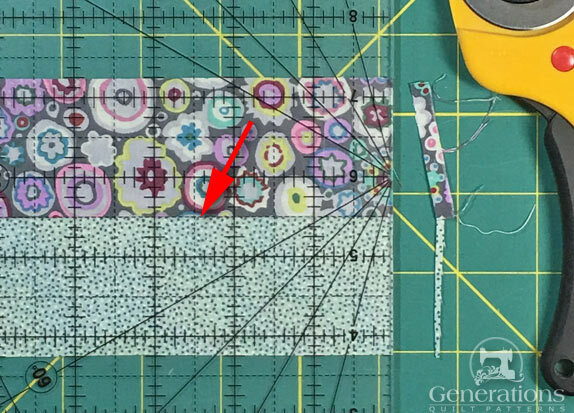 Use a light dab of Elmer's Washable glue stick to stick the wrong side of #1 to the unprinted side of the pattern. 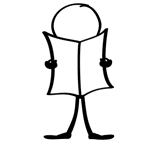 Use the dashed guides for quick and accurate placement. With RST, align a short side of a #2 with the edge of the #1 as shown below. Patch #1 is in place, wrong side very-very-lightly glued to the unprinted side of the pattern, #2 is positioned RST on top. From the printed side, stitch on the solid line between 1 and 2. Start and stop your stitching a generous 1/4" before and after (white arrows) the solid marking. Press. Add the #3 patch to the adjacent edge of #1. Line up the edges (white arrow). While this is a pretty straight edge, we're going to trim it to a perfect quarter inch to help us with the placement of #4. 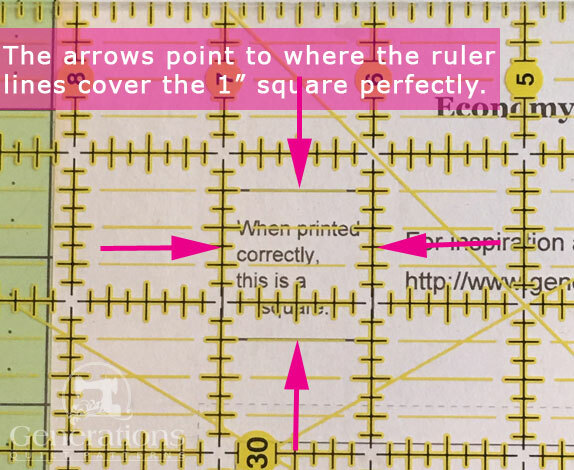 At your cutting mat, with the printed side up, match the edge of your ruler with the solid line between #2/#3 and #4. 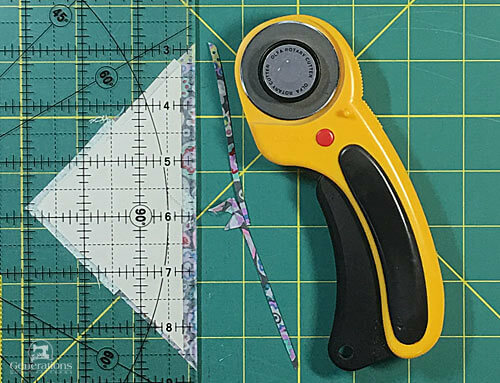 You can use your regular rotary cutting ruler for this, though an Add-A-Quarter Plus ruler makes the process virtually foolproof. 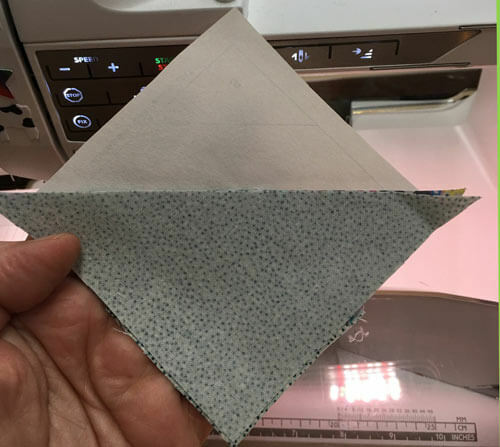 Fold the pattern back on itself along this crease. 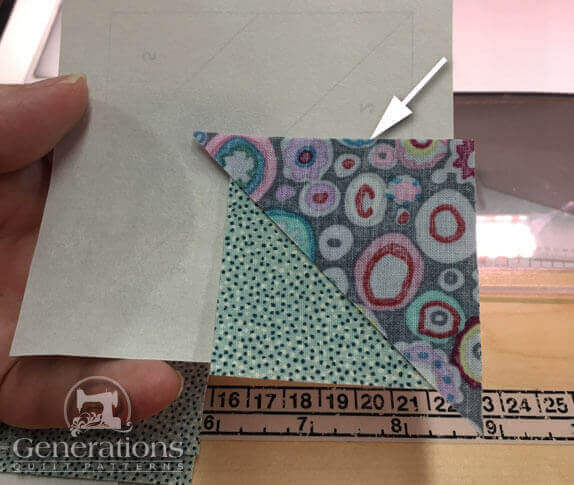 Place the 1/4" mark on your ruler on the folded crease. Cut with your rotary cutter. Voila! A perfect quarter inch. The perfect placement line for #4. And that thread tail from before is gone, too! The 1/4" line of your ruler is directly over the folded crease—trimming gives us a perfect SA. Trim the #4 patch to size just as you did #2/#3. Again, 1/4" on the ruler is placed directly on the fold. Trim. 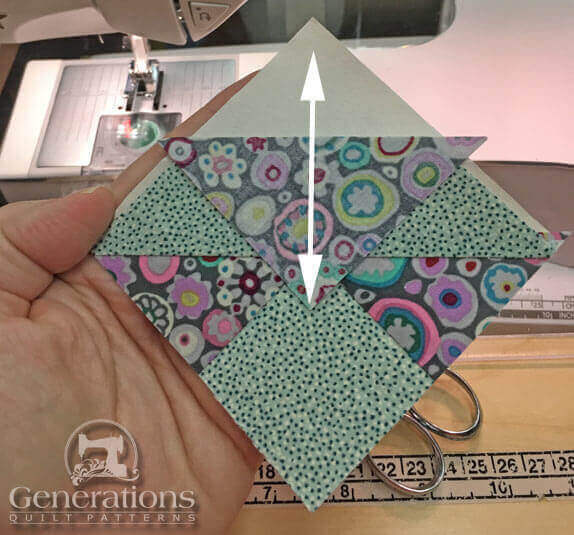 With RST, add the #5 patch—starting and stopping your stitches before and after the outside edges of the block pattern. Just like our last seam, because it runs from edge to edge, you can chain piece this seam. Give your units a good press. 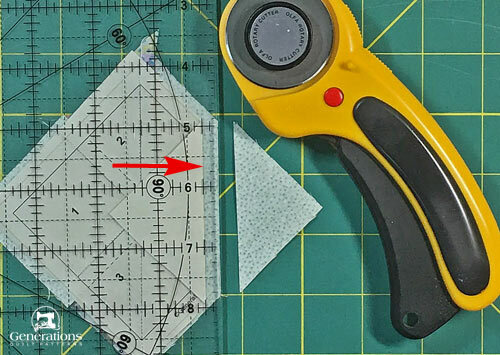 Trim to size with your rotary cutter and ruler by positioning the 1/4" line of your ruler with the dark SOLID line (red arrow) and cutting away the excess. The 1/4" mark on your ruler is on the solid outline for trimming this Medieval Walls quilt block down to its exact size. Turn the unit a 1/4 turn and trim again. Repeat for all sides of all blocks. Remove the paper. It's easiest if you remove the paper starting with the last patch added. Trim any pesky thread tails as you go. Return your sewing machine to your everyday settings. The remainder of the block is stitched with traditional techniques. Install your favorite quarter inch presser foot. Adjust the needle position if needed. Increase the stitch length. Using Patches #1-#5 cut from the green charts, click here for the instructions to make the Brave World variation with traditional piecing techniques. Once you are finished, hit the 'Back' button on your computer's browser bar to return to this point to piece your Medieval Walls block. First we create a stripset. It's used for both the corner and four-patch units. With RST, stitch the #6 and #7 strips together along their long side. Press, first flat to set the seam, and then open with the SA towards the darker #6. 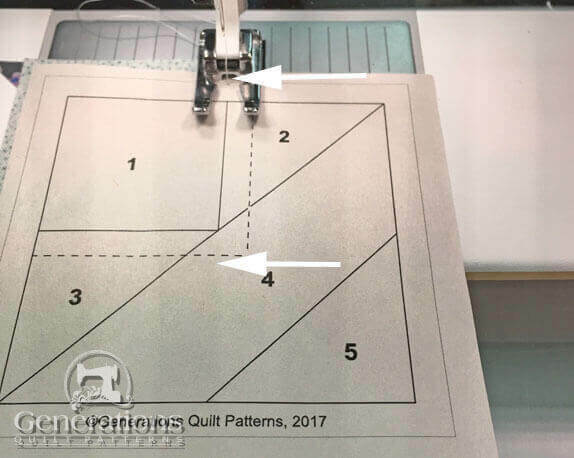 At your cutting mat, using the chart below check to see that your stripset is the correct width. Make any needed adjustments. 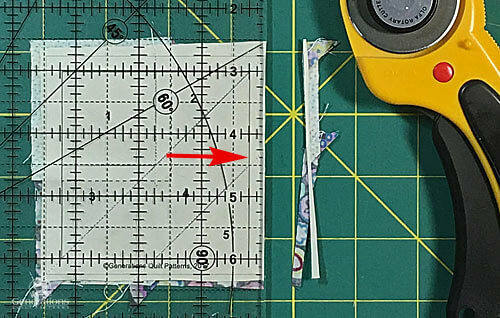 Straighten one short edge by aligning a line on your ruler with the seamline of the stripset. Keep this trimming at a 1/4" or less as shown here. You can see that this strip set for our 13-1/2" finished block DOES measure 3-1/2" wide exactly. Again, referring to the chart above, find the 'Sub Cut Width' that corresponds to your Finished Block Size. For our 13-1/2" finished sample, subcuts are made every 2". With RST, join two subcuts together alternating light and dark fabrics. Press the SA so that on the backside the SA are pressed toward one #6 as shown below (red arrows). The other dark patch has one SA pressed towards it and one away from it. The patch with the red star on it is the one with both SA pressed towards it. With RST, stitch a #8 to the left side of a subcut pair. Press SA away from #8. While counter-intuitive, this is so that the seams of this unit nest with those units next to it in your finished Medieval Walls block. 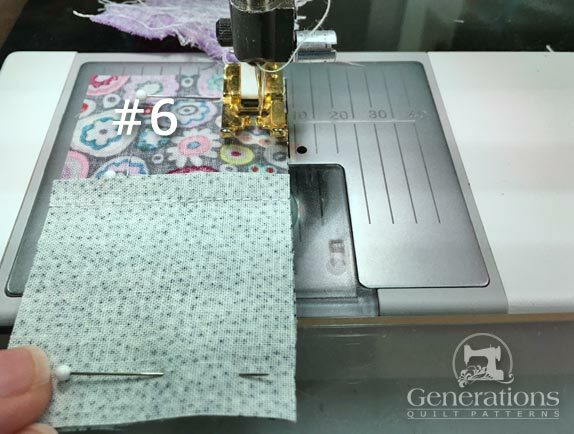 To make sure the #8 ends up on the correct side, stitch all the pairs so that the #6 is on top and feeds first into your sewing machine (below). 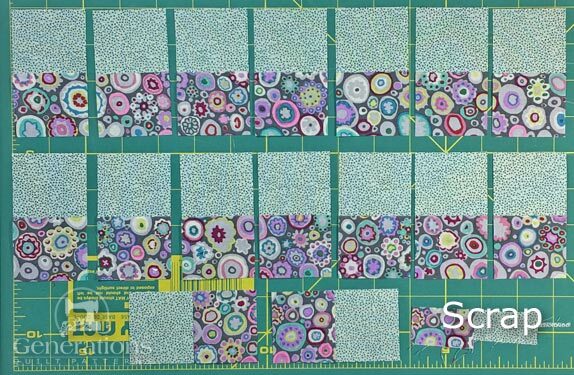 To make the vertical sashings, with RST sew a #9 square to a #10 rectangle. SA are pressed toward the dark #9. For the single, horizontal sashing, with RST, stitch two 2-patch units (#6/#7s) from our strip set together. Make sure the darks and lights alternate. 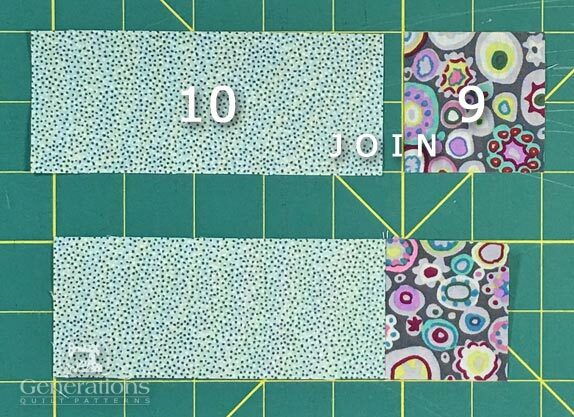 With RST, join the light edge of the pairs of 2-patches to opposite sides of a #9 square to create a single sash. SA are pressed away from the center #9. Almost finished! 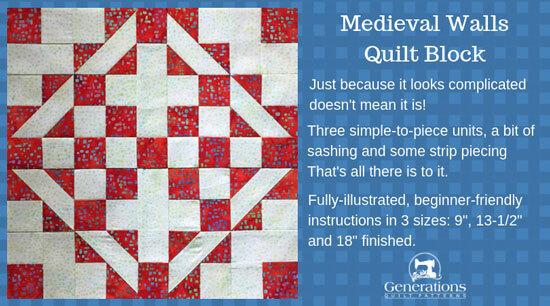 Click here to go to the instructions to assemble our Medieval Walls quilt block. "Double Wedding Ring Quilts—Traditions Made Modern"